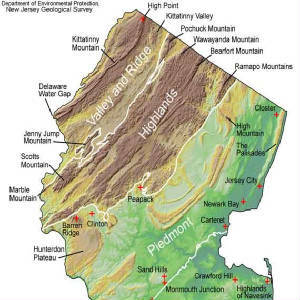 The most prominent geographical features of Northern New Jersey are the Kittatinny Mountains, and its foothills in the NJ Highlands, composed of the Pohchuck, Wawayanda, Bearfort, and Ramapo Ridges. They are home to some of the most dense hardwood forests in North America. Between the Kittatinnies and Highlands lies the Kittatinny Valley. This area is known for its many rivers, horse ranches, dairy farms, and ski resorts. In the central north part of the state are the Watchung Mountains, composed of three separate ridges: the Orange Ridge, the Preakness Ridge, and the Long Hill Ridge. The Palisades ridge that overlooks the Hudson River is located at the very most Northeast border of the state. Seventy-two miles of the Appalachian Trail lay in the Northwest corner of New Jersey. It enters the state as it crosses the Delaware Water Gap, near Dunnfield Creek and Mt. Tammany. On its way along the Kittatinny Ridge, the Appalchian Trail runs through Worthington State Forest where it passes by Sunfish Pond and Crater Lake. It then goes through Stokes State Forest as it crosses through Sunrise Mountain, and continues upward and northeast along the Kittatinny Ridge for about 40 miles. The Kittatinny Valley (also called the Limestone Valley) lies almost directly to the east of the trail, while the Delaware Water Gap lies to its west. At High Point State Park (1803 feet), the Appalachian Trail turns eastward and runs through the Kittatinnny Valley, the Pohchuck, Wawayanda, and Bearfort Ridges as it roughly parallels the NY State boundary. It goes northward into NY near Greenwood Lake. Many hikers along the trail have commented that the New Jersey portion was one of the most scenic parts, and one of the few times they encountered a black bear. This section of the state is dotted with many lake towns that include Budd Lake, Lake Mohawk, Lake Hiawatha, Swartswood Lake, and Lake Hopatcong. Hikers who are visiting or new to the area can find plenty of places near the Appalachian Trail for great hiking opportunities. Beautiful shots of the Kittatinney Ridge. A glider pilot flies over rural Northwest NJ. Flute playing at its best on Sunrise Mountain. A hike through the Delaware Water Gap, another hike through the Appalachian Trail in NJ. Next, a Friday the 13thdocumentary shot in Blairstown. Some Wildflowers of the NJ Highlands, a hike through Ramapo State Forest, and a local realtor takes you on a tour of Lake Mohawk. The National Park Service has designated the 44-mile long Musconetcong River as part of the National Wild and Scenic Rivers System. It starts at Lake Hopatcong and runs through the valley of the Kittatinny Ridge, ending in Riegelsville, where it enters the Delaware River.